HARARE – Finance Minister Mthuli Ncube is travelling to the United States next week, but before then he will announce that the government is ready to pay out $53 million compensation to former white land owners displaced during Zimbabwe’s fast-track land reform programme. 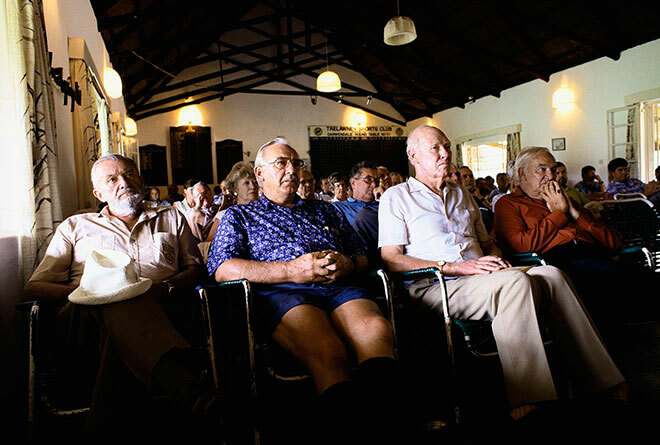 White farmers who have been designated to lose their land gather to discuss the legal options available to them. This meeting was held at a farmers’ club, near Chiredzi. It is the first step in a slow reform process which President Emmerson Mnangagwa’s government hopes will lead to the eventual lifting of United States sanctions on Zimbabwe. The farmers took their dispute over land dispossession to the SADC Tribunal, and won. But the government of then President Robert Mugabe in 2011 influenced other regional countries to suspend the Tribunal, established in 2005. It was re-instated in 2014 under a new protocol which limited the jurisdiction of the tribunal to only hear cases between member states, such as disputes over water or territory, rather than cases brought by individuals against states, such as human rights violations. A source familiar with the latest government moves said: “Ncube is attending IMF meetings in Washington D.C. next week and despite the noise, the Zimbabwe government understands it has to take certain specific steps if the sanctions are to be eased. Ncube first announced the $53 million compensation allocation when he announced his budget last year. At the time, farmers’ groups said the money was too little. Around 4,000 white farmers lost land in the reform programme launched starting in the year 2000, and are said to be owed up to $9 billion. Commercial Farmers Union (CFU) director Ben Purcell-Gilpin said the $53 million could not solve the compensation issue. But farmers were heartened that the government has not forgotten about the need to compensate those who lost their farms. The CFU said some of the farmers are in desperate financial straits. Purcell-Gilpin said it was possible that most of the $53 million allocated would go to compensate foreign landowners, who were protected by BIPPA trade agreements – though there’s no confirmation of that. Around 40 Dutch farmers under such agreements have been trying for years to get around US$25 million from the government. In his 2019 budget statement, Ncube said the government would introduce 99-year leases for new farmers; set up an agriculture commodity exchange; implement a robust loan recovery system for defaulting farmers; observe the rule of law, property rights and bilateral agreements; promote out-grower schemes by the private sector; and take measures to “crowd in” financial institutions. Ncube and Mnangagwa will also know that compensating white farmers alone is unlikely to move the United States government for as long as there is impunity in Zimbabwe, with military killings of civilians in August last year and January this year still unpunished.